Few trees invoke an iconic image like the walnut tree (genus Juglans). Its noble canopy hugs parklands, its wood builds artisan furniture, and its nuts do not require much of an introduction. 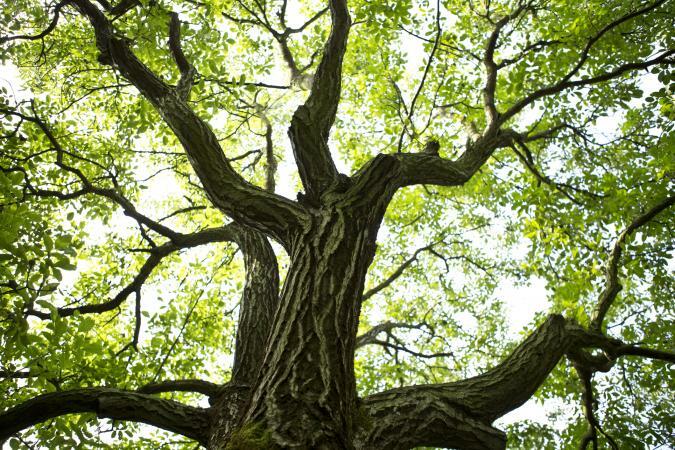 The walnut is related to other hardwood trees in the hickory genus - and there are nearly two dozen species and many cultivars of this impressive tree. Walnuts are deciduous trees native to Central Asia and Europe and prefer a balanced, fertile soil of either alkaline or acidic quality, with adequate rainfall or access to a steady moisture source. These are elegant trees that reach heights between 40-100 feet. The general hardiness ranges from zones 3-9, depending on the variety. Whether accenting a landscape in dramatic fashion or starring in an orchard, this tree is a gem. California has the most Black Walnut and English Walnut farms in the U.S. The stately walnut tree is easy to identify in the field. Young trees emerge from the hard seed (or "nut") after setting down a long taproot. The sapling has a tacky quality to the soft stem and leaves that release a sticky residue when touched. New leaves are a vibrant green and have a unique, almost pine-like, tannic odor. Adult trees retain the unusual scent and tacky leaves. The bark is deeply ridged in a consistent pattern and tinted a greyish brown. The understory is free of other small trees or vines. Walnuts produce a substance (juglones) that discourages plant growth around the base of the tree. Vibrant green leaves are narrow and set along a single stem. This compound leaflet structure is known as pinnation- the leaves resemble a feather set evenly along a stem. Autumn turns the leaves an ochre/yellow and the entire pinnate falls from the tree. The fruit emerges in the spring when tassels of green buds descend from the catkins. The catkins resemble a long, thin rattlesnake tail. Fertilized seeds ripen slowly over the summer, with these early nuts resembling fuzzy, green peaches. As the nut matures, a hard wooden shell is formed over the interior seed (walnut meat) and the outer husk is a pale green. Mature walnut husks have the look and texture of small Florida avocados. The black and English walnut are two popular and common varieties in the U.S. This tree is revered for its fine wood as well as its unique flavored nuts. 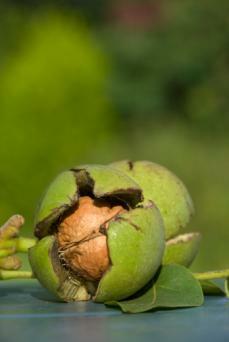 Black Walnuts are housed in a fissured, and surprisingly hard, black shell. The husk is thick and does not split open when ripe. Peeling the nut loose from the husk is a difficult task, leaving persistent tannin stains to anything it touches- but the mess is worth it. The fruity, luxurious tasting meats are hard to extract, but considered a delicacy by wildlife and chefs. Black Walnuts have a very distinctive and strong pine-like odor. Seedlings are regularly found growing in abundance around the adult trees - and these are the result of "forgotten" nuts planted by squirrels. The Carpathian, Persian or English Walnut is a well known, fast growing (2 feet per year) variety with familiar shelled nuts that are easy to crack. The broad span of foliage is set in a rounded frame. The pale acorn-colored shell is shallowly ridged with a wave-like pattern, unlike the dark hue of the Black Walnut. Winged nut meats are extracted without too much effort and have a sweet, woodsy taste - these are the most common nutmeats produced commercially. Walnuts are hardy and disease resistant trees. Decide on wether you want a fruiting, timber or shade tree (or all three). Before selecting the right variety, remember that all walnuts release juglone into the soil around their trunks. Shrubs, grass or ornamentals will not grow under any walnut trees. Don't set the walnut near a building or where cars will be parked - chunky nuts will rain down upon hood, windshield and roof. Walnut trees are messy, shedding leaflets, stems and nuts from late summer to fall. Dig a hole twice as big as the root ball. Set the tree into the hole and ensure the ground is level to where the tree and root sections separate; don't plant too shallow or too deep. Mix the dirt from the hole with loam and back fill around the roots. Firm the soil around the root ball and water heavily. In windy areas, stake trees to help them set root. Once established, walnut trees require minimal care in most regions. The trees set a long tap root allowing them to access water at greater depths. Because of this, do not plant these trees near sewer or septic tanks. Fertilize mature trees with an organic mix or commercial 10-10-10 nutrient blend. Follow manufacturer's directions for fruit/nut trees. Generally, don't apply fertilizers during drought times or when the growing season is over. Apply the product in spring and early summer. Prune trees as needed. Consult a professional arborist to handle difficult, or high, trimmings. Remove any damaged, diseased or dead limbs, and pick up leaf debris and fallen twigs periodically. This helps to prevent diseases and pests from taking hold. Fruits are set in the fall. English Walnuts are ready for harvest when the husks split and the nuts fall. Gather dropped nuts, hand pick from the tree (or with an apple picker), or gently shake the limbs to encourage nuts to fall. Black Walnuts are ready for collection in the fall. Ripe black walnuts will simply fall from the tree and are easy to collect. The husk does not split open, but it will be large and soft. Walnut trees rarely suffer from diseases but there are a few pests that pose a problem. Husk flies emerge from the soil around your tree. Eggs are placed on the nuts where the larvae burrow into the husk. When the husk is opened the "maggots" are seen in the pulp. The walnut shell is disfigured, however, the nut meat is not destroyed. These flies are only of concern to commercial growers selling shelled walnuts. If you chose to remove these flies use a sweet (molasses) base mixed with an insecticide. Fall webworms and omnivorous leafrollers lay eggs under the walnut leaves. Caterpillars hatch and begin setting webs that pull the leaves around them to allow the worm to feed in safety. The distinct curled and netted leaves are a telltale sign of webworm. Both pests can be controlled with a June application of BT (Bacillus Thuringiensis). Walnut blight may occur in areas with high or persistent humidity enhanced by dampness. The disease proliferates in these conditions (the Pacific Northwest region). Catkins and young nut husks will show a browning (almost burnt appearance) at the base. Bordeaux mix (Copper sulphate and lime), or other copper based sprays, are used to control the infection. Timing is key. In wet conditions, begin applications when half of the catkins have emerged. 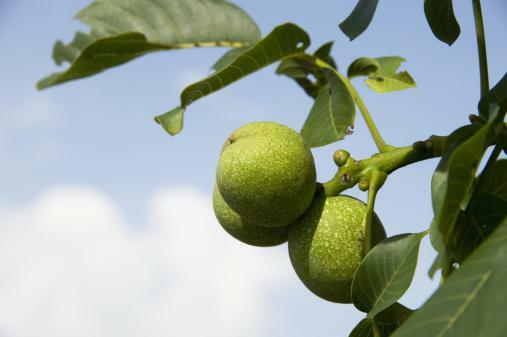 Walnut trees are a fantastic addition to an orchard or landscape. These majestic trees offer a bounty of beauty, wood, shade and nuts - they can't be beat. 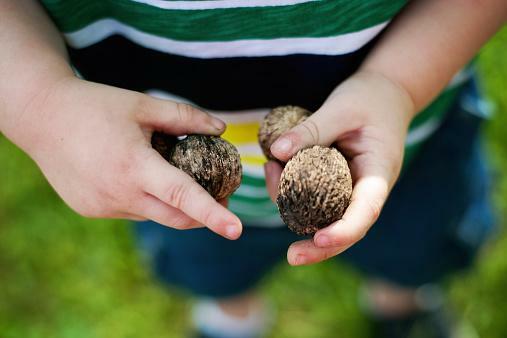 With few disease problems and care concerns, try planting a few walnuts in your area.